Sylvester loves baseball, but he isn't what you'd call a good hitter. 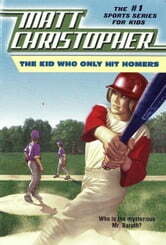 When he meets George Baruth, Sylvester goes from being a terrible hitter to the boy who hit only homers! But how will he answer some of the difficult questions that go with his new talent? And what is the true meaning of success? This beloved story about baseball, confidence, perseverance, and being a good teammate is a modern classic.